While unfortunately the short time line, distance and family commitments made it impossible for others in Robin and Meg's highschool group of friends to attend, we were able to make it. Having a free place to stay for most of the week we were there, no real travel plans for the year, Robin's graciousness in attending our wedding last fall and Meg's desire to attend made it easy for us to go. Once we found decently priced air tickets we accepted. We traveled out of Toronto on Air Transat, an airline I wouldn't go out of my way to use again - I hate airlines that still sell crappy headphones. Arriving at Gatwick we picked up our rental car and headed off toward Cornwall. We were both pretty tired, so we made good use of the service stations along the way to make sure we got out of the car and walked around a bit. 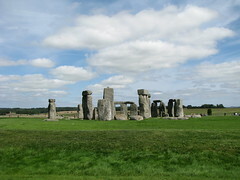 We also took the opportunity to stop at Stonehenge along the way which was pretty neat. We finally arrived in Cornwall and began the trek down some narrow roads, though, not the narrowest we would see. We ended our travel at Meg's aunt and uncle's home in St. Mawe's, a beautiful fishing village on the ocean. We had a great time in St. Mawe's. We did a number of the hikes, including one around St. Anthony's head - the road out to which saw us go through some crazy bits that were extremely narrow and one that was windy and totally covered over with trees, very sleepy hollowish. We hiked to a neat old church in St. Just in Roseland and drove over to Truro, via the King Harry Ferry, for groceries and some good microbrewery beer from Skinner's Brewery. We also took a trip a little further out in Cornwall, though quite as far as Land's End (which we heard was not that impressive). 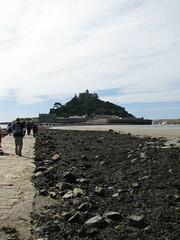 We visited St. Michael's Mount, a really neat castle on a small island in Mount's Bay at Marazion. It is a former monestary, built by the Benedictine monks of Mont St Michel in France. It's essentially like a little brother to the famous French island complete with the stone causeway out to the island that you can use at low tide, but that's covered at high tide. After spending the morning at the mount, we proceeded on down the coast to a really neat open air amphitheatre on cliffs overlooking the Atlantic. 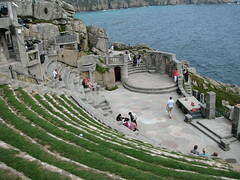 We had hoped to be able to take in a show at the Minack Theatre, but unfortunately we weren't able to get tickets so we just stopped in for a brief look. The theatre was built by a woman, Rowena Cade, on her property in order to stage plays in the village. Rowena worked on the theatre between 1930 and 1932, when the first play was staged there, and then kept on working to improve it until she died in 1983. The theatre is truly something to see, and I can only think that watching something like Shakespeare's The Tempest there would be a really neat experience. Leaving Minack we drove near Land's End, as mentioned previously, but decided not to visit and instead made our way back in the direction from which we had come. We made a pit stop to another seaside town in St. Ive's. We parked at a public lot which was way up on a hill and made our way downhill to the harbour. We walked around and relaxed with a beer in a pub before having some fish and chips for dinner next to the water. After that it was a hike back up the steep hill and the trip back to St. Mawe's. We also took a small ferry trip across the bay to Falmouth where we walked around a bit and found a pub for a beer. We checked out St. Mawe's castle, a neat little defence tower that was used to ward off the Spanish. They've got an entertaining self-guided audio tour you can pick up. At the end of the week we made our way up to Bristol where we attended the wedding of Meg's highschool friend Robin and his bride Helen. It was a great celebration that started with the ceremony and champagne in the church garden before a reception at a neat country home outside of the city. We left the reception around midnight in order to get some rest before the three hour drive back to Gatwick in the morning and a flight back across the pond. It was a great trip and I loved my time in Cornwall and hope that we can make a trip back sometime in the future.